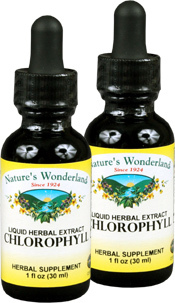 Liquid Chlorophyll, 1 fl oz / 30ml each (Nature's Wonderland) - Penn Herb Co. Ltd.
Chlorophyll is the power source behind green superfoods such as spinach, wheat grass, and chlorella. Let our liquid Chlorophyll help you feel and perform your best! It gently detoxifies while its full spectrum of vitamins & minerals rejuvenate and renew. Chlorophyll is a natural deodorizing that freshens breath too! Carry our convenient 1 oz size for those times when you need a quick, alcohol-free mouthwash. AMOUNT PER SERVING (2O DROPS/5ML): Chlorophyll (as Chlorophyllin Copper Compound from Mulberry Leaf). OTHER INGREDIENTS: Vegetable Glycerin, Deionized Water, Peppermint Oil. Supports red blood cell production; traditional blood cleanser; promotes regularity; supports intestinal health. NOTE: Chlorophyll is a natural green plant pigment, so it may turn stool or urine green. Internal deodorizer; oral breath freshener. Take 20-40 drops in water or juice, 1-2 times daily, or as needed. Hint: Add to green smoothies to pack more nutritional punch.